Throughout his life, he performed first in carnival sideshows, then in vaudeville, where he would share the stage with all manner of entertainers, and later, in his thrilling show, where he became the greatest magician and escape artist of all time. 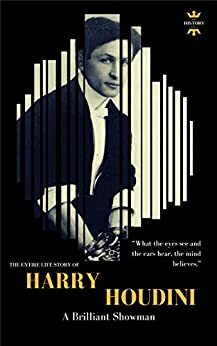 A brilliant showman, deeply interested in human psychology, and his life and work reflect these many interested, and he must have known the cachet being born in America would give his act. More than a little daredevil, Houdini performed feats never matched by any other person. This book reads like the plethora of 5 star reviews that I see on this page -- written by a bot. There are many fine Houdini biographies written for young readers. Go with a reputable publisher and series. Don't bite on this. In New York City, Houdini performed the suspended straitjacket escape from a crane being used to build the subway. After flinging his body in the air, he escaped from the straitjacket. Starting from when he was hoisted up in the air by the crane, to when the straitjacket was completely off, it took him two minutes and thirty-seven seconds. 5.0 out of 5 starsI really enjoyed it! I read it all in one shot, because I found it so diverting. I am anxious to find more books by the same author. Thanks so much for providing us with something as fun as it is educational. I simply can not wait to find the next one. Magnificent and educational! Never realized his life was so multi-faceted and fascinating! This book is very historical and interesting! The author written well! Great read! Love this book!!! Recommended! !